Fresh off of a College Park election where UMD for Clean Energy generated record turnout centered around making College Park a green leader, the Diamondback Staff Editorial recognizes us and our organizing prowess as a blueprint for future student involvement in local elections. Student election turnout used to be joke fodder for this page. The paltry number of student voters, especially in city elections, has been a thorn in the side of groups such as the Student Government Association, which have historically tried — and failed — to get out the vote in College Park. And then yesterday, a clean energy group led an 80-person march to the polls. UMD for Clean Energy, a student group that highly publicized its city council endorsements and then organized the march to City Hall, experienced a success that no other student group in recent memory has ever come close to in the city elections. In doing so, they also provided a clear blueprint for how other groups could do the same in both city and SGA elections. The group gave students a distinctly different reason to vote, compared to what student groups have done in the past. Most get-out-the-vote efforts have been ideologically non-partisan. They encouraged people to vote based either on their identity as students, or with platitudes about civic duty — both excellent strategies for generating apathy. But if you treat students like citizens with real concerns, the way UMD for Clean Energy did, you can see results. The group based its campaign around general environmental causes such as reducing carbon emissions and promoting sustainable development. It showed students how the city council elections could help make a difference in these areas and then channeled that passion in an organized manner. There is no reason this strategy should be limited to UMD for Clean Energy. In a variety of ways, large and small, the city council and SGA elections have broad impact on issues student activist groups care about. Finding these areas and showing them to students who care could dramatically increase voter turnout. Eventually 80 votes from members of one student group ramps up to 300 votes cast by members of four groups, and then 1,000 votes cast by members of 20 groups. Rather than throwing out 1,000 nets and hoping to catch a tiny percentage of votes, UMD for Clean Energy went hard after a smaller number of students with much more success. This is a lesson for any group that wishes to involve students in elections: Students who are not involved will not magically become activists when they hear blanket statements about which candidate wants to increase the penalties for noise violations; students who are involved will listen if they are presented platforms that treat them like living, breathing members of the College Park community. In the spring, student turnout will more than likely be poor for the SGA elections, perhaps hovering at about 4,000 total votes, as has been the case in the last few elections. But maybe if student groups follow the blueprint and stress issues that different student factions value, they will reap the same success in getting out the vote as UMD for Clean Energy. Broad efforts to encourage the masses to vote simply don’t work if students don’t see why their ballot matters. But by targeting students who care about certain issues and informing them about where the candidates stand, turnout could increase dramatically. If groups continue to serve vague platitudes instead of concrete policy reasons, the student body will continue to stroll down the road of apathy. So reads the Diamondback article in today’s paper. I’m also told we got covered by another local paper and by NPR (scroll down to middle of the page). In the past College Park elections student turnout had not broken 50 voters total, but I counted 80 students in our march alone, and there were many students in class during the march, but that voted with assistance from our group’s candidate interviews that we gathered over a two month period, as well as our endorsements. I am very confident in saying we turned out over 100 students for the day voting in a bloc for candidates that were the strongest based on our Green Platform. All in all, we endorsed 7 out of the 9 available seats if you include the Mayor, and 5 out of 7 were victorious(see results). This includes the rare election of a graduate student candidate who was very strong on our issues. The way the city council works is there are 8 council seats and the Mayor. The Mayor votes if there is a 4-4 tie on an issue. Although we feel unfortunate that 2 of the candidates we supported didn’t win, with 4 of our standouts getting elected, along with an environmental activist Mayor, UMD for Clean Energy is expecting to accomplish a lot on the environment, responsible development, sustainable transportation, clean energy, and energy conservation over the next 2 years. We were also very well received by the candidates, which is uncommon in these elections where students and the rest of the city clash. The candidate for Mayor Andy Fellows and a candidate for District 4 Mary Cook marched with us to the polls, and District 3 candidate Mark Cook sent some of his supporters to our rally. As the election results were announced, both winning and losing candidates expressed their appreciation to us for our group’s efforts to bring our issues to the forefront of the election. A few who went up to talk about their priorities for the next 2 years mentioned our group’s efforts, and talked about how the city needed to become a leader on green issues. In an unanticipated turn of events, I was called up to the microphone at one point to talk about UMD for Clean Energy’s efforts in the city council elections, how we achieved record student turnout, how much we had learned from interviewing the candidates, and our goals for the next 2 years. In short, although we would like our green voting bloc to make up even larger portions of candidates votes in the future, I think that the election phase of the Green for College Park campaign has been a success in that we achieved record student turnout and involvement, our endorsements got the attention of the residents, and we brought our issues to the forefront of candidates platforms, and priorities. If the 2008 Federal elections are a teaching lesson, it’s that record youth turnout on green issues is only a starting point. Now it’s time to get things done. Notable excerpts from Diamondback article are quoted below. City elections rarely see any “rush” of students: Student turnout in the council races historically struggle to top 50 voters. But about half an hour later, the UMD for Clean Energy’s “March to the Vote” rally made its way across the building’s downtown parking lot, prompting cars to honk their horns and cheer along as they passed. There was an estimated 80 students in that group alone. The students, who were joined in their movement to vote by District 4 candidate Mary Cook and mayoral candidate Andy Fellows, met at the sundial on McKeldin Mall and listened to a speech by alumnus and founding member of UMD for Clean Energy Davey Rogner about the importance of exercising the right to vote. “This shows that students are ready to connect with the city and citizens of College Park,” Rogner said in his speech. The group’s ability to mobilize flew in the face of skeptics, such as reelected District 2 city councilman Bob Catlin who said he doubted the rally was going to happen. “I’ve been here for so many elections, and they always say they’re going to bring out students, and it never happens,” he said earlier in the day. But mayor-elect Andy Fellows said after marching to City Hall with students amid a flurry of green hard hats, sign spinners and bongo drums, he felt “fired up” by the rally. “Even those who did not participate in the march were inspired by the group’s efforts. Junior finance major Carly Bender said a compelling argument by a UMD for Clean Energy spokesperson encouraged her to vote. Bender, an out-of-state student from New York, now resides in District 3. Though Bender also voted in the 2007 elections, she said she got most of her information about the candidates this year from UMD for Clean Energy’s website. After witnessing the march, Catlin conceded that maybe he had been wrong about the possibility of piquing students’ interest. Today is our local College Park city council elections. There’s been a lot of good press for UMD for Clean Energy, the student group I’m a part of that’s actively involved in this election. The Diamondback has already given our endorsements and Green March to City Hall attention. On election day, our march is plugged in regards to the logistics for the day, and our endorsements have been stirring up trouble in College Park. Overall, I think the coverage worked out favorably for us. Below are the excerpts from the article that discuss our group’s approach to endorsing candidates, and the disagreement a member of the community has with one of them. “The focus of the endorsements by UMD for Clean Energy took a different approach from either Sachs or The Diamondback, focusing mainly on each candidate’s environmental record and plans rather than their overall platform. The group’s political liaison, Hilary Staver, arranged interviews with 15 of this election’s 16 candidates — spending well over an hour on each — to write up detailed summaries of each person’s views and ultimately name seven standouts. UMD for Clean Energy has also lobbied at the state and federal level, but Staver said it’s easier to make a direct impact working at the local level — both by influencing the election and in dealing directly with whoever wins. The group is also planning a rally on McKeldin Mall at 5 p.m. today to promote its endorsements; Staver hopes 100 students will march the half-mile to City Hall to vote or to catch a van to the city’s second polling station in northern College Park. The three sets of endorsements included some overlap, most notably that none endorsed more than one District 2 candidate; UMD for Clean Energy didn’t endorse any of the three candidates. But while these groups are targeting their message at the city’s student population, its permanent residents are also taking note of the endorsements. Lourene Miovski, an environmental activist in northern College Park, said she heard from a neighbor that UMD for Clean Energy had endorsed Fazlul Kabir in District 1 after Kabir said so on his campaign’s blog. Miovski recalled a dormant debate she and some neighbors had with Kabir several years ago over the widening of Edgewood Road and cuts to school bus service to the Al-Huda School there — she accuses him of putting convenience over environmentalism by not promoting mass transit. She also said other candidates did more “heavy lifting” than Kabir over the years in lobbying the county to be environmentally sensitive in its long-term plans. Because Miovski thought the endorsement might have enough political clout to sway voters, she has printed and distributed about 300 flyers expressing her disapproval of Kabir’s past environment-related action and inaction. Staver said endorsing candidates in District 1 reached beyond students, in what she called an unexpected plus for the group’s advocacy. This is UMD for Clean Energy’s big event of the semester, and the culmination of the election phase of our Green for College Park campaign. We are looking to elect a fiercely green city council that will make College Park the gold standard for sustainability in our state. Last week we announced our endorsements, and tomorrow, we will march to the polls to vote and demonstrate that we want our city to be a green leader. Another update will come tomorrow! The Diamondback article is re-posted below. The video is from the kickoff event for our campaign back in September. In a culmination of efforts that began in September, UMD for Clean Energy, an environmental activist group at the university, is organizing a march of student voters committed to green policies to the City Council election polls at city hall tomorrow. The Green March to the Vote begins at 5 p.m. at the sundial on McKeldin Mall and will feature a speech by alumnus Davey Rogner, a founding member of the group. Following Rogner’s speech, students will march down to the city hall in green shirts and green hard hats, while carrying wooden wind turbines. Since the beginning of the semester, the group has been forming a Green for College Park campaign centered on an Energy Loan Fund, a pool of money to be lent out to residents to make energy-efficient upgrades in their homes. They have also held discussions with council candidates to determine their stance on environmental issues and encouraged students to vote in the elections. Dernoga said they have also manned information tables and had speakers come to educate the group and university community about going green. The group has also reached out to other environmental and activist groups at the university about the cause. The campaign, while formed around the loan fund, also deals with the state Greenhouse Gas Reduction Act, a law passed this spring that aims to create green jobs and promote clean energy. The group believes that more funding will go to cities and counties who are leaders in environmental policies, and they want College Park to be at the forefront of the green movement. Laura Calabrese, UMD for Clean Energy’s organizational director, named the Energy Loan Fund and tax cuts for green businesses as ways to make College Park more attractive for green investments. The group endorsed seven candidates last week: Andy Fellows for mayor, Patrick Wojahn and Fazlul Kabir in District 1, Stephanie Stullich and Mark Cook in District 3 and Marcus Afzali and Mary Cook in District 4. They did not endorse any candidates for District 2. Calabrese said the group went through their whole platform with candidates to gauge where they stood on issues. The election phase of UMD for Clean Energy’s Green for College Park effort is winding down to a close. Our political liaison Hilary Staver has an Op-Ed out in the Diamondback today releasing our endorsements. There are five days left until the College Park City Council elections, and if this year is like any other, chances are not many students would be voting. Traditionally, student turnout in these elections has been abysmally low: In 2007, fewer than 50 students at a university of tens of thousands took the time to cast their votes in the elections. But this semester can be different. 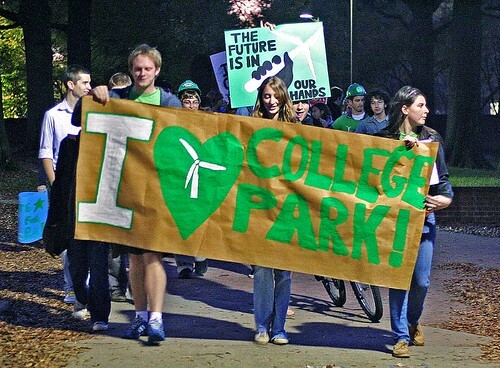 UMD for Clean Energy has been working on a campaign called Green for College Park. In light of the many developing or recently passed state and federal laws mandating renewable energy portfolios, energy consumption reduction standards and greenhouse gas reduction targets, we feel the near future is going to bring unprecedented levels of investment in renewable energy, energy efficiency and low-carbon technology. The regions that stand to benefit the most from this investment will be those with policies and programs in place to encourage it. We feel with the right leadership there is no reason why College Park cannot be a leader on these issues and a model for the county and the state. The first step in this direction is to elect a city council that will make these issues a priority, and that is where we, the students, can do our part. In order to gauge where each of the candidates stands on sustainability issues, UMD for Clean Energy has put together a platform of policies and programs that we have presented to each of the candidates for the city council. The platform includes, among other suggestions, a revolving loan fund to help College Park residents finance energy efficiency improvements for their homes, tax cuts to attract green businesses to the city and encourage existing businesses to decrease their environmental impacts, white roofs and LEED certification for new buildings and development projects, further development of biking infrastructure and better recycling practices. After meeting with all the candidates and hearing their positions on the platform, we have decided to endorse the seven who we believe to be outstanding on these issues and will do the best job of making College Park a leader. They support most — if not all — of the ideas on our platform, and many have a history of interest and advocacy in this area. We have posted complete information from our meetings with all of the candidates on our website (www.umdforcleanenergy.com) that I encourage everyone to explore, but the names are as follows: Mayoral candidate Andy Fellows; District 1 candidates Patrick Wojahn and Fazlul Kabir; District 3 candidates Stephanie Stullich and Mark Cook; and District 4 candidates Mary Cook and Marcus Afzali. We are not endorsing any District 2 candidates. I implore you, if you are registered in College Park, take the time to vote next Tuesday. Voting in these elections for candidates who are strong advocates for sustainability gives us a chance to invest in the future of not just the community around us but one small piece of our society at large. We’ll be having a rally at 5 p.m. Tuesday at the sundial on McKeldin Mall to distribute information about where the candidates stand on our platform, and then we’ll be marching down to City Hall to vote. Please join us and cast your vote. Together let’s make this the year that counts.